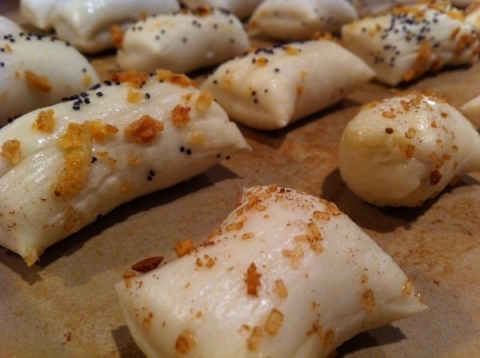 Here’s a great snack to make for parties, either your own or to bring to a guests house. I love soft pretzels and here’s a great recipe I always use. You can choose to make the original pretzel shape or you can cut them in to bite size pieces. You can also have a variety of toppings. For this round I had 4 difference toppings, sesame seed, corse sea salt, poppy seed and fried onions and finally a sweet treat cinnamon sugar. Stir sugar into first amount of warm water in a small bowl. Sprinkle Yeast over top of sugar and warm water mixture and let stand for 10 minutes. Combine second amount of warm water, flour and salt in a large bowl. Add yeast mixture and mix. Add a bit more flour if needed so the dough is not to sticky. Place dough on a floured surface and knead for 10 mins until dough is smooth and elastic. Place the dough in a greased bowl turning once to grease top and cover with a tea towel. Place in the oven with the light on for 45 mins until the dough is double in size. 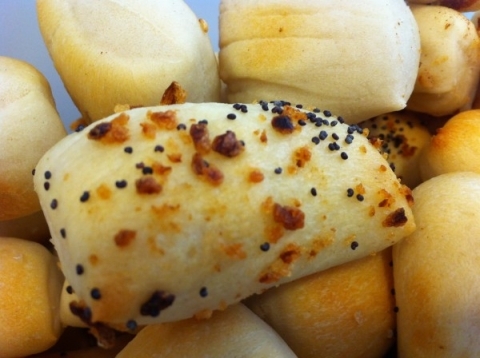 Punch down the dough, cut into 12 pieces and roll the dough into long ropes. Cut 1 inch pillows from each rope and place on a baking sheet. Bake for 15 minutes at 450 degrees Fahrenheit. Remove from oven and enjoy. I personally love dipping these into a marinara sauce or nacho cheese sauce. For the cinnamon perhaps a fruit dip would be a great pairing.